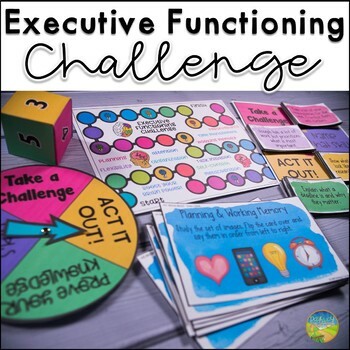 Use this Executive Functioning Game to teach, discuss, and practice executive functioning skills including planning, time management, working memory, self control, flexibility, organization, task initiation, metacognition, attention, and perseverance. 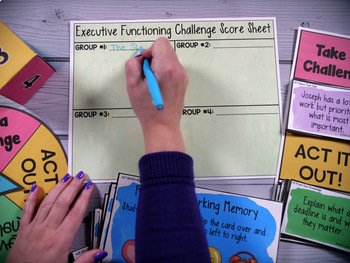 Over 200 executive functioning cards are included to prompt students as they play! Cards focus on identifying executive functioning skills, answering questions about executive functioning skills, acting out EF skills in a variety of situations, and performing small challenges to show your own skills. Why Teach Executive Functioning Skills? Executive functioning skills are the basis for planning, organizing, initiating, and following through will all tasks, assignments, and problems inside and outside of school. Many students who forget assignments, are disorganized, can’t complete long-term assignments, have trouble focusing, and experience difficulty with change often have weak executive functioning skills. These are the students who need to be taught explicit skills in order to become successful in school and in life after school. Simply put, executive functioning skills are necessary life skills. There are TWO ways to play! • Students spin the spinner to answer an executive functioning question. • After answering, students will roll the dice and move forward. • When landing on a special spot, students will be able to answer a special brain challenge! They will roll the dice. If they answer the challenge correctly, they will move forward that amount. If they answer incorrectly, they must move back! • The first person to get to "finish" first wins! • Students will come up with a team name. • Groups will take turns spinning the spinner and answering executive functioning cards. • After answering correctly, each group will earn a point. • Once a group earns 5 points, they can answer a special brain challenge! They will roll the dice. If they answer the challenge correctly, they will earn that many extra points. If they answer incorrectly, the group will lose that many points. • You can choose when a team will win depending on the time you have to play! This game is aimed to help students at higher elementary, middle, and high school who need help with their executive functioning skills. Many times, these students are very bright but perform poorly in school because they are lacking these skills. Learning these skills can benefit of number of students also requiring special education services, such as students with ADHD, learning disabilities, and more. This game can be helpful for a range of professionals, including regular education teachers, special education teachers, 504 coordinators, and more. These materials can also be used during advisory for middle and high school students. 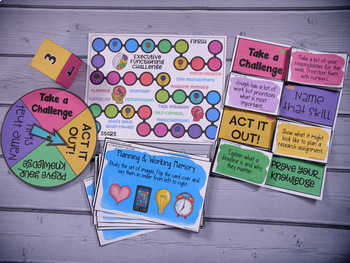 Buy the Social Emotional Learning Games Bundle! Use this set of games to practice critical social emotional skills including building empathy, perspective-taking, executive functioning skills, social communication, and social problem solving! Four games are included with a huge selection of student cards and activities so you can play the games again and again. You will save 20% by buying the bundle! Find MORE Executive Functioning Resources! Target executive functioning and study skills necessary for academic success at the middle and high school level. 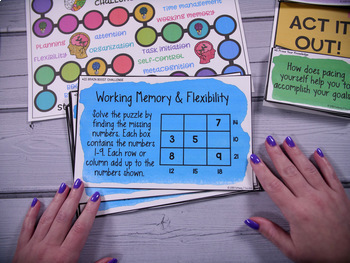 The bundle includes over 300 pages full of lessons, templates, and workbook pages to teach study strategies and ways to improve executive functioning skills. It includes a HUGE selection of my executive functioning and study skills materials in one place. Click on the ★ above to follow my store! If you have questions or problems please contact me through Product Q & A and I'll get back to you as soon as I can! Disclaimer: These resources and materials are for supplementary support/education purposes and not intended as a replacement for counseling, education, or other necessary supports. Educators, parents, counselors, and others who utilize these materials are encouraged to seek out additional support, as needed.